This manufacturer of tubing coils draws rough stock through a straightener prior to coiling it on finished tubing spools. 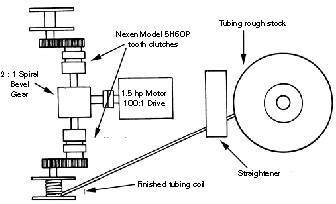 They needed a high torque capacity, positive drive that would allow them to engage each of the two tubing spools. Two Nexen Model 5H60P tooth clutches solved the problem. The high torque, positive engagement capabilities of the clutches allow he customer to independently draw the rough stock through the straightener and onto either of the finished tubing coils.